The Durban Sisterhood has won the Or Ami Award for Excellence in Sisterhood Programming for its work with the Mavela Creche in Ndwedwe, which it has supported for the past four years.The project forms part of a programme of the World Conference on Religions for Peace, aimed at child-headed households, orphans and other vulnerable children in rural communities. The Sisterhood of Temple David in Durban is a founder member of the pilot study and continues to be a major partner in the project.The Or Ami “Light of my People” Award, which will be presented to the Durban Sisterhood at the Women of Reform Judaism’s (WRJ) biennial conference in the US in December, honours a sisterhood or district that undertakes outstanding and significant social action, community service, or educational projects.”This is, I believe, the fourth time this award has been made by the WRJ to a South African Sisterhood,” said Monica Solomon, president of the South African Union of Temple Sisterhoods (SAUTS). 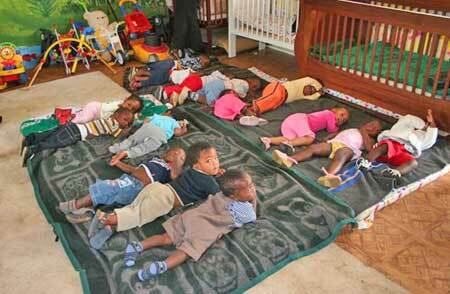 “It is a wonderful achievement for the women in Durban who have done wonders at this creche. “Kol Hakavod to all of you on winning this prestigious award. Your Sisterhood has set an outstanding example to us all,” she said. Children, including some who head their own households, celebrate with the Durban Sisterhood after painting the walls of their creche. MAVELA CRECHE. The first part of the project, intended to ensure that older siblings in child-headed households could go back to school. Mavela crÃ©che opened in February 2003 with 36 children. It grew very rapidly. The Sisterhood built a new classroom and ablution block in 2004/5 and today there are 91 pupils in the school, aged from six months to five years, many of whom are from child-headed households and orphans. FOOD DROP OFF. Thirty two child-headed households – families who have lost their parents to HIV AIDS – are supported through funds provided by the Jakamar Trust and other donations. The Sisterhood does food drops every four to five weeks, and provides blankets, clothing, assistance with school uniforms and school fees. CHILDREN’S TRANSPORT. The Sisterhood pays for transport of children who live too far to walk to the crÃ©che. Initially 25 children were transported, but the costs of transport have increased and fewer children are now transported. INCOME GENERATING CENTRE. The Sisterhood has assisted in building a log cabin which will be used for income-generating projects to create capacity and sustainability within the community. 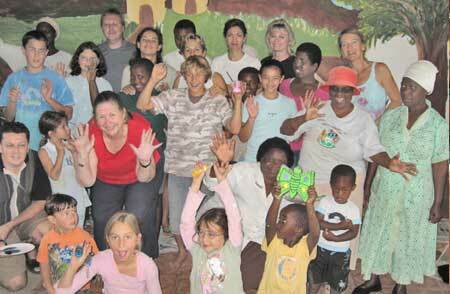 This is done in conjunction with the Friends of Mavela in Holland and Dianne McColl and family. The Sisterhood is now looking for projects and assistance in setting up these programmes. The women have started making clothes for children in the community and hope to obtain a sewing contract from the Department of Health. BABY CENTRE AND HOME BASED CARE HOSPICE. The Sisterhood are collecting funds to provide a room for a baby centre at the crÃ©che, where space is now at a premium. There are also plans to build a room for home-based care workers to meet and train, as well as a place for patients to come for relaxation and care. Care-givers and children line up outside their crÃ©che after a day spent repainting it. The drab white walls were transformed into hills and trees and flowers and a river with fish. More than 25 people were involved, including children from the child-headed households. Click here to see the full photograph. The United Sisterhood received the Or Ami Award for the MC Weiler School in Alexander Township, Johannesburg, in 2005, the year it celebrated its 60th anniversary. The primary school was started in 1945 by Rabbi Moses Cyrus Weiler, his wife Una and Rita Marx, in order to get the children off the streets of the township and into school. 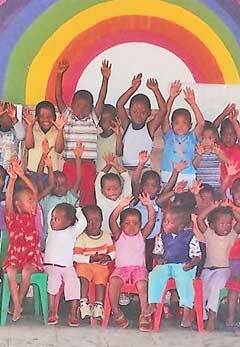 The United Sisterhood, with the help of its sponsors, provides food, clothing and education for these children. be innovative or implemented in an unusually creative manner.